ON A HILL BETWEEN EL YUNQUE RAINFOREST AND THE SEA. A truly special place. 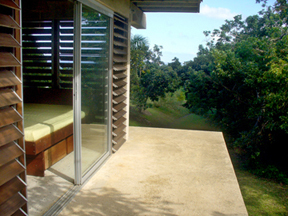 Yunque Brisas Villa offers the unique experience of staying in luxury, right near both the rain forest and the beaches. Surrounded by gardens, 20 years in the making, The trail that winds through our 9 acre property offers walking, jogging and birdwatching. Architecture design by a student of Frank Lloyd Wright. Our location, a five minute drive to the entrance road into El Yunque Rainforest and within sight Luquillo Beach is uniquely ideal to enjoy your vacation. 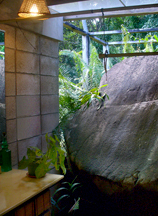 Yunque Brisas Villa is a one bedroom villa rental with a complete kitchen, bath with a rock! and living dining room, all of which are open to the breezes and have lovely views of the sea, mountains and surrounding landscape. 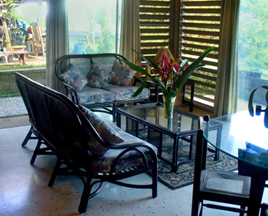 Yunque Brisas Villa comfortably accommodates one couple. One child over 12 years could be added. Brad, your host, is a former chef who is happy to prepare and serve you a romantic dinner, by advance request. Great breakfasts*. Picnic lunches can be ordered as well. 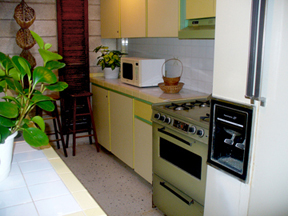 Prices and Reservations: Yunque Brisas Villas Rental is not child proof. $135. per night plus a 7% PR room tax. Price includes breakfast! *We serve a complimentary breakfas daily and offer a choice of 5 different breakfasts, additional fees for some of the more exotic breakfast menus! We do have a 2 night minimum. . . Weekly rate $800. plus tax. E-mail: < bradfendentz@aol.com > Tel 787- 646-4196. Cancellation Policy: We require a 20% ( or one nights stay) non refundable deposit to hold your reservations. Complimentry breakfast makings in your fridge! You are free to pick fruits & vegetables in our organic orchard and garden. Looking east down the hill towards Luquillo Beach and beyond. 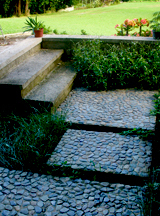 The landscaping on this 9 acre property is immaculate and beautifully planted. Severals trails for easy walking. Sorry, no children allowed. Location: Across the street from the entrance to Rio Mar Resort, where they offer tennis courts, golf, restaurants and beaches. Queen size bed in the bedroom with complete privacy, no one can see the bedroom! 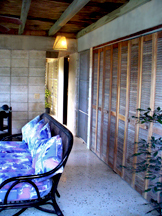 Prices and Reservations: Yunque Brisas Villa has one bedroom and comfortably accommodates one couple. One child over 12 years could be added. 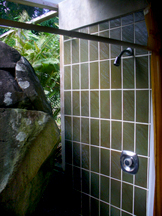 Yunque Brisas Villas Rental is not child proof. $135. per night plus a 7% PR room tax. We have a 2 night minimum. . . Weekly rate $800. plus tax. Cancellation Policy: We require a 20% ( or one nights stay) non refundable deposit to hold your reservations. 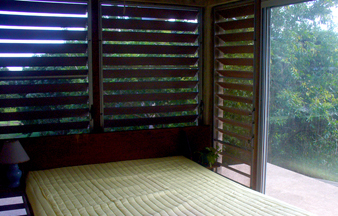 Back to the Rainforest Lodging page • Luquillo Lodging page.